The NBA Playoffs is here and the 65-17 Houston Rockets look to silence a lot of doubters and contend for their first Larry O'Brien in over 20 years. The Rockets start their journey against the young and hungry Minnesota Timberwolves who will be making their first playoff appearance after a 13 year drought. So without further ado, let's not beat around the bush. We decided to get the staff together (as we do every year) to preview what looks to be an interesting, but likely lopsided first round series. Salman Ali: I've never been more tempted to pick a sweep than I was for this series. 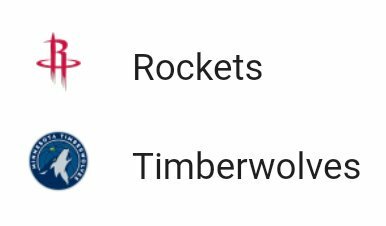 The Rockets are just so far ahead of the Timberwolves on both ends of the floor and present a math problem that makes leads insurmountable. Minnesota also presents a ton of exploitable bigs for James Harden and Chris Paul to exploit in pick and roll and isolation situations. I'm giving Jimmy Butler and Karl-Anthony Towns a game because they deserve that respect. Forrest Walker: The only reason I’m not picking Rockets in 4 is because I’m an inveterate hedger. This really should be a sweep and probably will be but at this moment I’m inclined to give a gentlemanly nod to the Wolves. Paul Michie-Derrick: The Wolves cannot guard the Rockets’ pick and roll. Harden and Paul will eviscerate Towns. Kyle Chilek: The math just isn't on the Wolves' side. They take the fewest threes per 100 possessions in the league while the Rockets take the most. They also are one of the few teams that don't switch the Rockets pick and rolls, which allows the Rockets to find open threes off of help easier. Matthew Cardenas: Both teams have such drastically different playing styles, with the Rockets style more built for today’s NBA. Jimmy Butler will be able to get a win for the Wolves, but that’s about it for them. Jorge Flores: While the Wolves have a lot of firepower and are riding the high of ending their playoff drought, the Rockets are just too talented a team. The Wolves don’t play good enough defense to stop the Rockets (nobody does) and Houston should have no problem making it to the semi-finals. Taylor Pate: I could see 6 game series happening with Jimmy Butler returning. The Wolves performed like a top 4 team in the West when he was healthy and he covers up many of their mistakes defensively. Who or what is the biggest 'X-Factor' in this series? Salman Ali: I think it's Clint Capela. One of the bigger reasons Houston dominated the season series is Capela was an offensive nightmare for Minnesota. He averaged 18.8 PPG, 10.0 RPG, and 1.5 BPG on 80.1% True Shooting (!!!). However, he wasn't very good defensively (117.7 Defensive RTG) and he's going to have to be better to contain Karl-Anthony Towns and keep the series short. Forrest Walker: This feels lame to say from a Rockets perspective, but Jimmy Butler is probably the x-factor. At his best he resembles an MVP. He’s just coming off a nasty injury, however, so his best is something we may or may not see. Paul Michie-Derrick: The only potential advantage that the Wolves have is the matchup of Towns against Capela, and if Capela plays well, the Wolves have no shot. Kyle Chilek: Gerald Green. Due to the injuries to Mbah a Moute and Ryan Anderson he will be in a bigger role than expected, and they'll need him to perform. If he hits shots and defends competently, the Rockets will breeze by, if not, the Rockets might struggle. Matthew Cardenas: I’m really eager to watch Clint Capela in this series. He was able to get under the skin of Karl-Anthony Towns in the regular season. Capela will have to consistently defend Towns well, whether it be in the post or off the dribble. Jorge Flores: The most important X-factor for me is Clint Capela’s effectiveness defensively and on the glass. With Karl Anthony Thomas and Taj Gibson battling in the post, Capela has the opportunity to be really disruptive and stymie Minny’s inside game. Taylor Pate: Clint Capela is going to be the X-Factor in this series. He averaged 18 and 10 against the Wolves in the regular season, shooting 79% from the field. His defense will be key to stopping Karl Anthony-Towns, but even more importantly, Capela makes Towns work on the defensive end. Salman Ali: 3s attempted, 3s made, and 3-PT percentage. As mentioned before, the Rockets tend to out-math the Timberwolves simply because they take and make a ton more 3s than Minnesota. If Houston wants to continue that dominance, they have to run Minnesota off the line and continue their long-range onslaught. Forrest Walker: This is a series with the Rockets so the big stat will always be three point shooting. If their shooting falls off a cliff like last season in the playoffs, the Wolves will win a game or two. If they shoot at their season averages, the Wolves are going to be disintegrated. Paul Michie-Derrick: The Wolves have to out-rebound the Rockets if they want to win. Kyle Chilek: The most important stat is the three point attempt rate of both teams. The Wolves shoot a three on just 28 out of 100 of their possessions. That number is nearly half of the Rockets 48 three point attempts per 100. That gap will have the Wolves trading two points for three even if they are able to score consistently. Matthew Cardenas: In the four regular season matchups, the Rockets made 69 three’s (nice) compared to the Timberwolves 34. This is where the different styles of play really make a difference. Look for the Rockets to live with the Wolves shooting long two’s. Three beats two. Jorge Flores: This might be a really lazy answer, but I think 3-point shooting is the most important stat for the Rockets. Last year, 3-point shooting was make or break for the Rockets, but that’s not really the case this year as they have elite playmaking, really good defense, and one of the best offenses of all time. Still, 3-point percentage could be the difference between a few too-close-for-comfort games and a few blowout victories. Taylor Pate: The Rockets 3-point shooting is going to be the key. Minnesota and Houston have wildly different styles, and if the Rockets can make double-digit three pointers, Minnesota will have a tough time keeping up. Salman Ali: I think Jimmy Butler, if healthy, can really swing the series. He's the only player Minnesota has that can credibly defend James Harden and he'll be tough to stop, especially with Luc Mbah a Moute out for the Rockets. Forrest Walker: This isn’t hard. James Harden is the most important player in any series he’s in until the conference finals at soonest. If Harden continues to orchestrate the offense at this level, nobody can slow down this Rockets team. He’s become a pillar of fire in isolations, and his stepback three is a waking nightmare for opposing teams. When he’s at the top of his game, he brings ruin and despair on other fans, and nobody on the court is his equal in this series. Paul Michie-Derrick: James Harden. No one except a healthy Warriors team can beat the Rockets when Harden’s playing well. Kyle Chilek: The most important player is James Harden, of course. They'll need him to find open shooters out of pick and roll and make sure Jimmy Butler is working on defense, as he will likely be the one tasked with slowing Harden down. Matthew Cardenas: PJ Tucker will have more of a workload on the defensive end with Luc Mbah a Moute likely out for the entire first round. He will see time defending Andrew Wiggins and possibly Towns in the paint. Tucker’s three point shooting has greatly improved since he was moved to the starting lineup. He will need to continue to be a credible threat throughout the series. Jorge Flores: James Harden is the most important player in this and any series the Rockets play in. If he keeps up his MVP play, then the Rockets are capable of beating anyone in a seven-game series. Taylor Pate: Jimmy Butler is probably the most important player in this series. His health is key to the Wolves’ success. If he’s not fully healthy, the Wolves don’t stand a chance.